Crossing the bridge between cultures begins with a step. 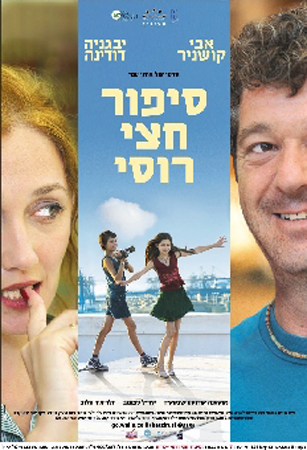 The son of battling parents falls for a Russian girl when he takes up ballroom dancing.Hebrew language with Hebrew, English, Russian & French subtitles. Available for PAL(EURO) and computer system. Chen, a young boy, is battling a cultural conflict between his Russian born mother and Israeli father. She is cultured and used to the finer things in life, including theater and fine dining. He is gruff on the outside but sweet on the inside - a Sabra; and looking to make his young son a man rather than the wimp his mother is raising. One day, Chen stumbles upon a ballroom dance class for young people and sees Natalie, a stunning Russian young girl he falls in love with immediately. His interest in Natalie leads him to taking ballroom dancing and to ultimately bridging the cultural divide of his own family - through the Cha Cha and the Tango. Hebrew language with Hebrew, English, Russian & French subtitles.